At the Royal Albert Hall, London until February 19. Opens in Bern, Switzerland on February 28, 2015. You may have been to the circus before. But you ain’t seen nothing until you’ve witnessed the extreme mastery of the Cirque du Soleil’s elite of artistes. As a child, I had two versions of what circus life was all about. The first was when a convoy of colourful trucks paraded through the town and a huge Big Top tent was erected in an empty field opposite my primary school. We marched through mud in wintry darkness (though it was probably only 6pm) to sit on wooden benches, heady with the smell of sweet candyfloss loitering with intent in the air, to watch a spectacle that included slightly scary clowns and scrawny lions performing unbecoming ‘tricks’ of obedience while their master cracked a whip. My other view of circus life was a more glamorous Hollywood-style affair: the classic 1956 movie Trapeze, to be precise. Starring Burt Lancaster as a retired aerialist with two hungry high flyers, Tony Curtis and Gina Lollabrigida, vying for his tutelage, it was a sneak peek behind the scenes of the circus life, and there was drama, there was passion, there was tension, there was excitement and there was high-flying action. Cirque du Soleil’s Kooza is a brilliant reinvention of traditional circus performances, reaching new heights, quite literally, with a succession of amazing acts performing spectacular feats of jaw-dropping daring. Please – please! – don’t try this at home. Obviously, circus life has come a long way since my childhood memories, and yet there are similarities too. It was another wintry dark night as we walked towards the mother of Big Tops (the Royal Albert Hall) and there was certainly plenty of drama, passion, tension, excitement and high-flying antics. Kooza, one of the 19 Cirque du Soleil shows currently being performed around the globe, combines the two great circus traditions: spectacular acrobatic performances and the art of clowning. The slapstick antics and tomfoolery are fun if you like that sort of thing. The Innocent, a child-like figure in striped pyjamas, strikes a slightly melancholy figure as he flies his kite without playmates. The Trickster is the mischievious magic maker, the King is absurdly foppish. There’s a few spurts of audience participation which are amusing, too, with the invited members of the public entering into the spirit with good grace. For younger members of the audience, the most memorable ‘clowning’ is likely to be Bad Dog ‘peeing’ – and yes, there is water involved. The large-scale scenery is impressive, with many intricate set moves performed swiftly as the arena is transformed for different acts. The costumes are Las Vagas spectacular, with thousands of sequins and feathers creating dramatic looks, including a rather freakish Skeleton Dance. There’s also a live band with singers and musicians belting out a strong soundtrack from a raised stage. 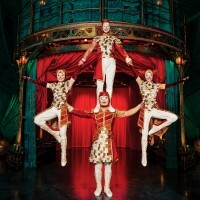 It’s the amazing acrobats who really steal with show, with their superhuman shows of power and prowess. These are agile artists with Olympian strength, showcasing a gold standard of virtuosity. They have the audience on the edge of their seats during the performance and excitedly comparing notes afterwards about which bit was the most awesome! So how do you measure their talent? Let’s take the tightrope as an example. So you expect it to be high and you expect someone to walk it, and perform a few jumps or turns. In Kooza, there are twin high wires at 15 and 25 feet above the stage, and four tightrope walkers. But walking and jumping is not enough. 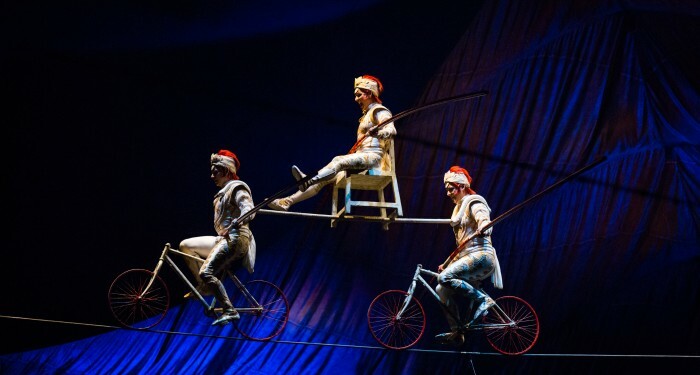 These artists tackle the tightrope on bikes, and then two bikes balance an artiste balancing on a chair between them! Then there’s a juggling unicyclist. Pretty standard stuff, you might think. Only this unicyclist is juggling a woman, who is performing her own bendy acrobatics around his body as they cycle around the arena. Oh, and there’s the hula-hoop girl. If you’ve ever tried it, you’ll know it’s tricky enough to sustain one hoop in a twirl; here, you’ll see a magnificent seven hoops, all twirling furiously while she twists and turns her body into impossible contortions. Every discipline is taken to the extreme and we’re talking some seriously show-off stuff. What is really striking is the absolute precision of each performance. The artist who painstakingly perches eight chairs, one by one, to create an ever-increasing tower in a flowing slow motion of balletic poses until he finally – and breathtakingly – balances on the very top with just one hand. The quick-fire action of the tumbling house troupe, flying through the air and creating human pyramids, is a dizzying affair, as bodies fly here and there with perfect precision. When one artist appears on huge teetering metal stilts, the audience are aghast, thinking, no, surely they’re not going to… And before you know it, the artist is flying through the air in a dramatic somersault to land sure-footed, or rather -stilted, on the ground. And the most daring of all? The Wheel of Death (the name is a bit of a giveaway). Looking at bit like two rotating hamster wheels at either end of a giant rotating contraption that reaches right up to the gods and casts great shadows across the expanse of the Royal Albert Hall. 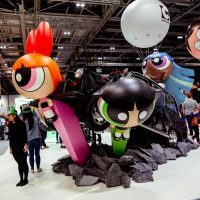 The artists arrive, with menacingly painted faces, growling and roaring with adrenalin, before leaping at lickety-spit lightning speed into the wheels. There was a split second when I looked away and when I looked back, thought, where’s he gone? One minute he was inside the wheel, the next he was on top of it, then jumping outside it – with the whole thing rotating at heart-stopping speeds. My thoughts? Burt and Tony, eat your hearts out. Why go? For the amazing acrobatics and feats of daring that will have you on the edge of your seats. Who is it best for? Children ages 3 plus are admitted but it’s probably best for children aged 5 plus who enjoy an adrenalin rush. There are a few surprises (like a figure suddenly pouncing from a box in the opening scene which made me jump) and the Skeleton Dance is a bit spooky, too. 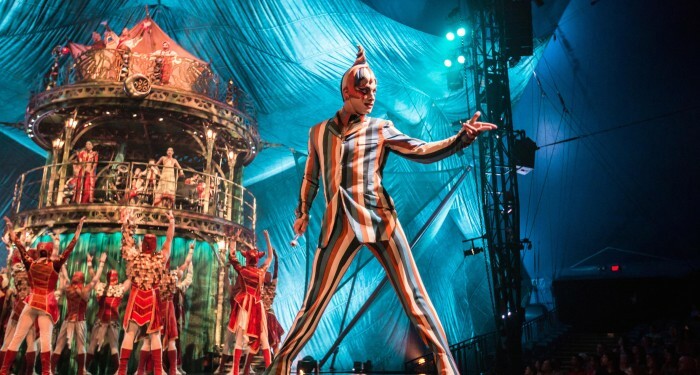 Top Tip Relive your favourite moments by watching videos of Kooza. Perhaps it might encourage your child to take up gynastics! Our favourite bit The Wheel of Death has the biggest wow fact, but the graceful elegance of the rhythmic gymnast was also amazing. Reminiscing about seeing the circus as a child. Don’t go If you’ve just eaten a big meal. All those lean and lithesome bodies, with not an inch of fat on them anywhere, will make you feel like a sloth! While you’re there Pop over the road to admire the Albert Memorial, which was commissioned by Queen Victoria in memory of her beloved husband, Prince Albert who died of typhoid in 1861. You’re also in the vicinity of some of London’s finest museums: Science Museum, Natural History Museum and the V&A. Did you know? The modern-day circus was the brain-child of Englishman Philip Astley, who had honed his horsemanship skills during military service and then opened a riding school in London in 1768, with a circular performance arena that he called a ‘circle,’ or ‘circus,’ which would later be known as a ‘ring.’ By 1770, Astley began augmenting his equestrian shows with jugglers, acrobats, ropedancers and clowns, who were meant to entertain the audience between riding tricks. Because clowns have a lot of sole! Artist’s notes Cirque du Soleil is a Quebec based company recognized all over the world for high-quality, artistic entertainment. Since its dawn in 1984, Cirque du Soleil has constantly sought to evoke the imagination, invoke the senses and provoke the emotions of people around the world. It all began in the early 1980’s in Baie-Saint-Paul, a charming village nestled on the north shore of the St-Lawrence River, east of Quebec City. Les Échassiers de Baie-Saint-Paul (‘The Stiltwalkers of Baie-Saint-Paul’), a theatre troupe founded by Gilles Ste-Croix, walked on stilts, juggled, danced, breathed fire and played music. These young entertainers, among whom was Cirque du Soleil-founder Guy Laliberté, constantly impressed and intrigued Baie-Saint-Paul’s residents. In 1984, during Quebec’s 450th anniversary celebrations of Jacques Cartier’s discovery of Canada, Guy Laliberté convinced organisers the answer was a provincial tour of Cirque du Soleil performers and it hasn’t stopped since!